TOMBSTONE, Ariz. -- Border Patrol agents have seen numerous ways people try to smuggle drugs across the Arizona border in recent years. They can now add marijuana hidden in a casket to the list. 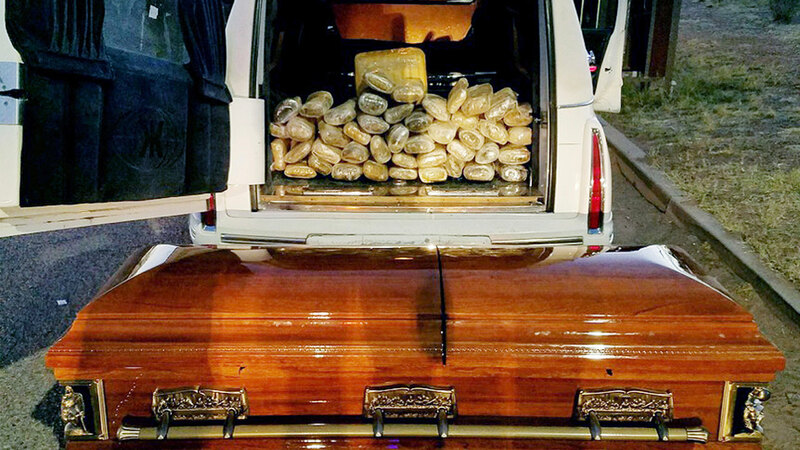 Agents working an immigration checkpoint in southern Arizona said they stopped a hearse last weekend and found 67 pounds of marijuana inside a mahogany coffin. The multiple bricks of marijuana had an estimated street value of more than $33,000, Border Patrol officials said Monday. The hearse carrying the casket was stopped Saturday evening on State Route 80 near Tombstone. Agents said the driver - a 28-year-old U.S. citizen - gave inconsistent information and a canine unit was brought in to check the hearse. The drug-smelling dogs alerted agents despite several bags of manure that had been placed inside the casket in an attempt to conceal the marijuana odor. The driver, whose name hasn't been released, was arrested on suspicion of narcotics smuggling, Border Patrol officials said. In recent years, Arizona agents have found drugs taped to the bodies of some smugglers, seen ultralight aircraft try to drop drug shipments in the desert and seized bundles of marijuana that were shot from Mexico with devices such as air-powered cannons and catapults.